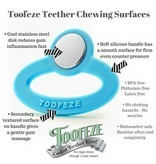 Toofeze is an innovative teether made from silicone and stainless steel. The cool stainless steel disk reduces gum inflammation quickly and can be dipped in ice water to provide an anesthetic for baby's gums. 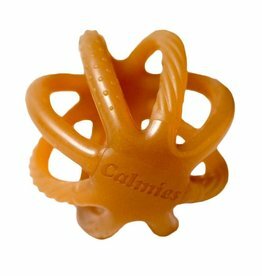 The smooth silicone handle provides even counter pressure while the raised lettering gives baby's gums a much needed massage. In addition to helping ease teething pain, Toofeze promotes early motor skills development. It's mirror-like surface encourages self-recognition and admiration. Toofeze is long lasting; it's functional from first signs of teething, through 2-year molars. You can feel good choosing Toofeze knowing that it is approved for all infant developmental abilities and exceeds all current CPSC, ASTM and CPSIA regulations. It is free of BPA, phthalates, and latex. By design it is antibacterial, hypoallergenic and free of an toxic, leaky liquids or mold. 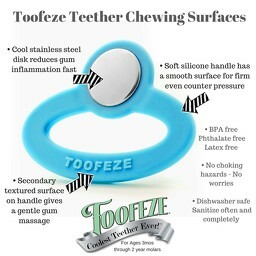 Toofeze are also dishwasher safe so you can sanitize it completely. 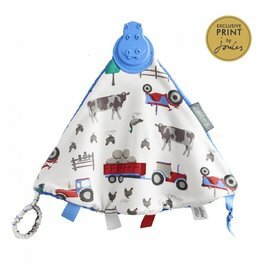 Dribble bib and teether in one! 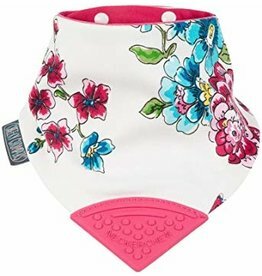 No more dirty teethers or damp clothes. A lovey, teether, tag toy, and stroller toy in one! Environmentally responsible, handmade natural rubber teether designed to stimulate baby's senses.